A friend called to ask if I wanted any rabbits. I said, “No!” when I thought she meant pets but she really meant dinner so that was fine. Her husband brought them over and informed me that he had gutted them but left their jackets on. 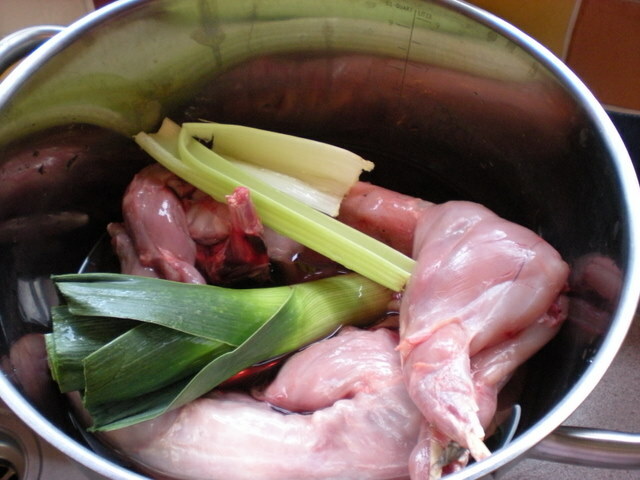 My children were slightly aghast but fascinated when I proceeded to cut off the ends of the legs so I could skin them. I think it is important for them to see that food does not start off in cling-film. Now, I don’t do offal but the liver and kidney looked very fresh and delicate so I flash fried them as a “starter”. I was pleasantly surprised. Freya tried it, Fergus loved it but Fenella was not impressed. The main course was Lapin Supreme with mash so very economical. The leftovers made a slightly unusual soup the next day with the addition of pearl barley. I have been avoiding shopping again. Our local supermarket is closing for a 3 month refit so I will work my way through all the tins of kidney beans at the back of the pantry until there is nothing left! I enjoyed watching the revamped “Gardeners’ World” with the children so we bought some courgettes at a local plant sale to see if we can grow some produce to accompany the free meat. I worked my way through Chapter 2 of EQ6 Simplified one evening. I am wondering if I will ever manage a project of my own as I follow each line of instructions to the letter without really knowing what I am doing or why. I really must sign up for The Quilt University class for beginners to see if that makes it clearer. Mo, Tania and I went on a jaunt to Tarland this week. It was a beautifully clear day and a very scenic drive. We went to a picture framer, a tannery, an antique warehouse and saved money by enjoying a flask of coffee with posh biscuits in the car. We did not spend anything until stopping off at the junkshop on the way home. I bought a Magimix for £5, Tania picked up a Samsonite suitcase for £2 and Mo bought a great big table for £20 with the most amazing huge legs. I hope she gets fed up with it eventually because it would be great in my summerhouse. I’m not sure whether my Magimix blade is really sharp or not or whether it was simply defeated by the type of soup that I put in it. I collected my new hens on Friday and got a tray of lovely fresh eggs too. I was supposed to get 5 hens but couldn’t choose so ended up with 6. I think one will have to go back. They are all ganging up on the Arucana that lays blue eggs so she is hiding under the henhouse. Prizes were awarded at Paducah this week. Although I knew that mine would not win a prize, I had secretly hoped that it might. The placed quilts are on the AQS website and they are STUNNING!! I have appealed on the APQS forum that I would like a picture of it hanging at the show, hopefully with people looking at it. 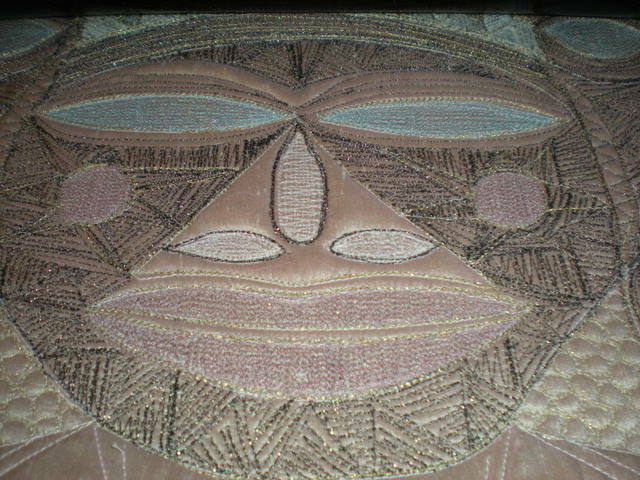 I have been working on the Buddha quilt this week, trying to finish piecing the top before I go to Holland. It is a definite project for the “How Not to Quilt” book. I hope that if I forget my advice, someone will remind me not to use silk again in a hurry because it moves about and is tricky to square up accurately. I may not ever bother with Trapunto again. I decided to sew some of the outlines of the Buddha on the domestic sewing machine because I am not always great at following outlines on the longarm. 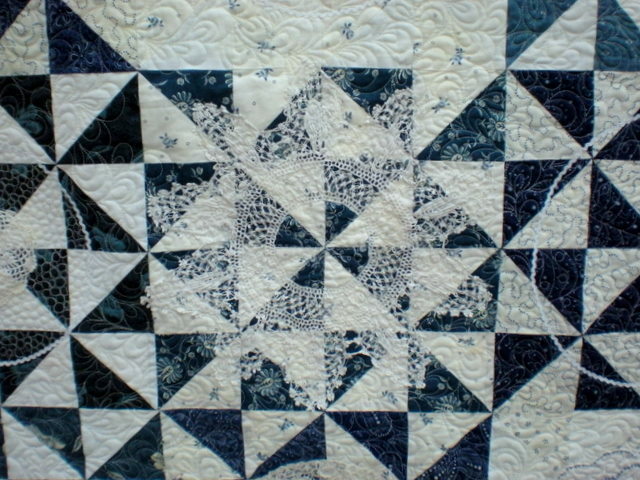 I did this on bamboo wadding which is thin so it behaved well for DSM quilting but was a bit pointless for Trapunto. Then I had to snip carefully all the way round Buddha’s body. There are several puncture wounds… I even trimmed back a bit of wadding that was meant to be the ears so had to stick it back on with 505 spray glue which has now left an ugly splodge on the silk. The prairie points that were so carefully measured slithered a bit on the silk so some of them have gaps in between. This project will be embellished with LOTS of Mother of Pearl buttons to disguise the damage. I may even have to buy more buttons. I did eventually get the whole thing together after trimming the inner borders back to 2 and 5/8” – don’t even ask why it was such an odd measurement. There is also a flat piping but I decided that it was too wide. Instead of taking it all apart I will just fold it over again and couch on some strung pearl beads. This type of approach explains why British quilter, Philippa Naylor won the machine workmanship award at Paducah and why I probably never will… but I don’t suppose she will bring out a “How not to Quilt” book either! I was delighted to receive 7 packs of white baby rickrack from Bonnie in New York so I could outline the plates on the Hungarian quilt. This was a bulky exercise and reminded me why I prefer longarming to battling with a domestic machine. My Mother came to stay this week but the sun did not come out until the day she left. We all enjoyed her visit. I got her to construct the Clothkits dress for Fenella since I could not figure out what to do. She did not really enjoy this project because the dress fabric is a large print of a famous tower block. I bought it to see if I could manage simple dressmaking (not the case) and it was a bargain. She was glad that the yurt and house now have wood stoves as the Easter Holiday weather was grey and damp. My Dad gleefully gave us a daily weather report from England that it was gloriously spring-like. We had a jaunt to a new garden centre and bought 5 perennials having been inspired by “Gardeners’ World”. They are still in their pots sitting on the doorstep waiting to go into the ground. I went into The Highlands to see Paul the Yurtman on Saturday. He wanted me to see a different door frame for my exhibition yurt. He had his original frame up which is 18 feet in diameter and slightly higher. It also had a curved door frame. It was more money than I had originally planned to spend but I had to agree that it would be a far superior exhibition yurt so ordered it and paid 50%! Of course, it means that I will have to make about 4 more patchwork panels. We had a tour of his workshops and saw lots of great projects made from reclaimed wood. I asked if he would also make me a wood carved green man face but he said he was planning to run a course so I’ll have to sign up for it if I want one! Paul’s real job is an upholsterer so I have also ordered a canvas patchwork crown cover with clear top for my own yurt for the summer. On the way home we stopped at “Treasures”, the gem shop in Kincardine O’Neil. I bought Mo a fluorite egg for a belated Easter present. It is for concentration (I think… but I may not have been paying attention). As I stopped for milk I was delighted to discover that Somerfield in Banchory, which is closing for a major refit, had a computer problem with the pricing of red South African wine. I bought 6 bottles for 49p each. I could have bought more but I thought that I should leave some for other customers! 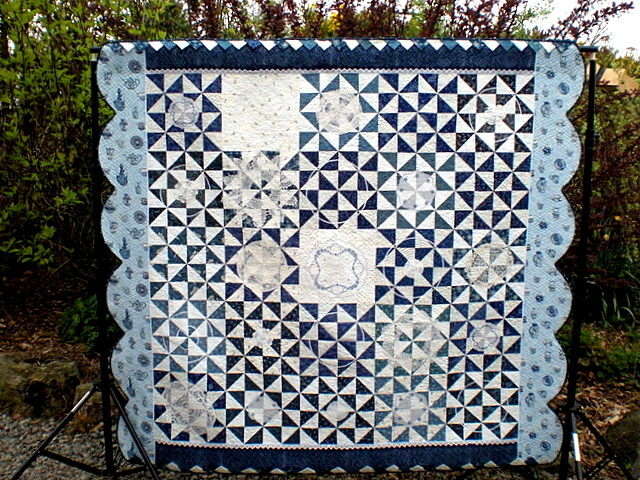 I spent ALL week quilting the Hungarian Broken Dishes quilt and the quilting is now complete. I really hurt my back, though! I have even got the sleeve, bias binding and label ready. Bonnie inNew Yorkwas commissioned to buy all of the white baby rickrack in her local Walmart to go around some of the plates and edges so I’m just waiting for that to arrive in the post so I can finish it all off. I am a little concerned about the entry form. I don’t actually have one yet. I have emailed the Hungarian Museum so hope they reply soon. They may not even accept my quilt as it is not made purely with Hungarian Kekfesto. There is also some reproduction indigo and the coffee pot fabric border. I had fun tracking down doilies so it all looks a bit like a plate rack. The very wide borders have had freehand cross hatching done to represent the crackle of old dishes. These will be cut into scallops. It took me a while to figure out what plate to use to draft these as I did not want terribly sharp clefts in the scallops. I expect that if I get a bumfle in the binding at these points, I will stick on a button or yoyo to hide the lump. The children were great – the weather was poor for the first week of their Easter holiday but they entertained themselves and even did chores after I promised to pay them and take them for fish and chips in Stonehaven at the end of the week. Instead of quickly realising that there was a sticky situation and putting down dry straw, branches etc, he got it thoroughly grounded. This was a rescue by the farmer situation – I told him exactly who had been driving at the time! Having been reading the APQS forum posts this week, I am seriously considering some large templates for basic customer quilts. These might enable me to take more in and finish them more quickly than I do at present. These would also be great for anyone wanting to hire my machine for DIY quilting. The outlay is expensive so I will have to be sure that the equipment would earn its keep. There are so many things that are bought and never used in a quilter’s studio! I thought I would get on and draft the pattern for “Silent Movie Star” for the magazine out on the computer with EQ6. Hmm, not so easy as I first thought. I thought I had read the manual and understood some of it but the computer did not seem to do what the book advised. I have now bought another book called “EQ6 Simplified” and on another quilter’s recommendation, may sign up for a Quilt University class on EQ6. I am fed up with all of my unused gadgets and gizmos – I either have to master them or sell them. There was a discussion on the forum this week about computer drawing tablets and sketching out ideas for quilting in Paint straight onto a picture of the quilt top using the stylus. I have one of those too. I got it with a program for the Designer SE and have never used it either. I opened a quilt photo in Paint, plugged the tablet into the slot where the mouse should go and was drawing – well, scribbling would be a more accurate description. I expect it takes practice but I was reminded of why I have always hated drawing. I have completed the set of Courthouse Steps blocks that will go around the “Pearls of Wisdom” Buddha. This was all calculated and measured to finish at a 12.5” block so that it would produce a nice even 12” block when sewn together. I don’t know whether because I used different materials including raw silk or I just wasn’t very careful but all of the blocks finished at a scant 12”. 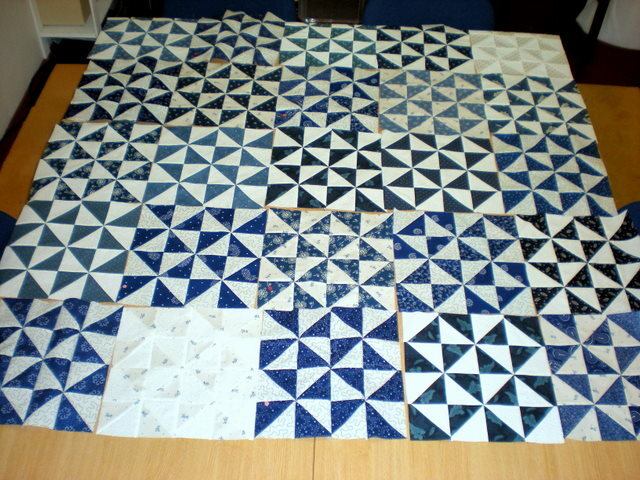 Now having had a tidy up, they will end up as 11.5” blocks when sewn. That is a very odd number. Next time I will try to remember to make the outer strips wider so I can trim them back to an even 12.5”!! My neighbour’s husband was convinced that Wellington would not commit such a terrible crime and decided that he had merely chased off another predator such as a mink or fox. I was sceptical. However, the ghillie reported a large, renegade black Labradorthat was on the loose at the time of the rabbit murder so it looks like Welly may just be in the clear. Nevertheless, I got out my school teacher whistle, kept him on the lead for a few days and he has been as good as gold, almost – he is trying to behave at least! Textile artist, Annabel Pattullo, was visiting family in Scotland for a few weeks so she did 2 workshops on photo to fabric transfer in my studio. I busily made cups of tea and listened in a bit. She gave so much great information and the students all seemed to enjoy trying out all of the techniques. Annabel is living in central Istanbul with her German husband at present, where it is very busy and noisy so to come here on a glorious spring day was quite a contrast. Several people asked if I would run more workshops as they were impressed by the surroundings so that is really encouraging for getting the new studio built. I hope we are close to getting the final warrants. I had a one hour conference call to APQS one evening to hear about what is involved as an APQS sales rep. There is not a great financial reward for this but I think it will be a good thing to add to the list of workshops available here in due course. I have got the Hungarian Broken Dishes onto the frame so there is no excuse now but to get started. I have even managed to collect some great vintage doilies to add in amongst the quilting so it looks like there are plates on it. I must be taking my quilting more seriously because I even made 2 mock-up blocks for the Buddha courthouse steps before deciding on the final placement instead of just throwing the first thing together. I have almost cut out all of the strips and centres for that too. The mailing instructions arrived for the Open European Quilt Championships in The Netherlands so I sewed a label onto Bewitched and just have to pack it all up for the post. The editor of “Popular Patchwork” magazine, Jane Rae, asked if I would like to do a project for the edition that comes out to coincide with FOQ! Definitely… amazingly I had kept all of the rough scribbles so I decided that it was bound to be easy to transfer all of this to EQ6. I even read the manual. The program will not do what I want it to and the toolbars are not the same as in the manual. I may need to phone for help! The children surprised me by eating and enjoying their unusual supper of Pigeon Pittas with Pea Pesto. The pigeon breasts were pan fried and were such rich meat that they almost tasted like liver. I thought it would be fun to invite friends to a meal which started off with Pumpkin Potage and follow it with Pecan Pie – Perfect! I helped Mel to round up her free-range hens so that they could have their wings clipped as they have been running wild in Durris village. They have been digging for worms in neighbouring gardens and even visited the school. They took a bit of chasing and Mel was not altogether confident about grabbing and holding tightly onto the chooks. In the end I had the chooks while she did the trimming with kitchen scissors. We just trimmed back the flight feathers so they could not flap their way over the fence. I showed her that the skin and bone was quite a long way back and the hens would not get hurt. I went to pick out my own new hens later from Michelle, the Mad Chicken Woman. She started off with a clutch of second-hand chickens and now runs a successful breeding programme of rare breed hens. They will be quarantined for 2 weeks so by the end of April I hope to be getting my own fresh eggs again. The weekend whizzed past with a trip to Glasgow IKEA which took up a whole day and as usual, I did not think of what I could have bought until I got home. I spent Sunday tidying the summerhouse, sewing room, yurt and had my first attempts with EQ6. It is the school Easter holidays this week so I must try not to get too frustrated that I won’t get as much work done but if I can at least make good progress with the Hungarian quilt I will be pleased.